§ Usually deep but may show marked stratification of sand, clay, and loam. § Mostly found in Indus plain. § Mainly quartzitic or calcareous sands with little silt and clay and low concentration of nitrogen and phosphorus found along the coast of Karachi. § Developed in drier parts of the country in Indus plain. § Typical of much of the plains of Pakistan often Alkaline with the low organic matter. § Mainly derived from Alluvium, Neutral or Acidic containing ferrie contents. § Characteristics of the tropics with monsoon rainfall, usually Acidic, poor in mineral nutrients and have a low silica/sesquioxide ratio. § Brown earth, slightly acidic or Neutral with high base status. § Derived from a very wide range of parent materials and more or less immature. § Mostly with adequate mineral nutrients and humus. § Soils are usually acidic. § Occurring mainly on a highland in the dry regions of the Himalayas and western mountains. § They support usually xerophytic or degraded communities of vegetation. · All grasslands have a common climate characterized by high rate of evaporation, periodic severe droughts. · A Rolling to flat terrain. · They occur largely where the rainfall between 25-75 cm/year. · Too light which neither supports the growth of forest nor encourages a desert. · It covers an area of 7,86,095 sq. Km. · Nearly 60% of Pakistan consist of mountainous terrain and elevated plateaux; the rest is lowland, generally below 300 meters. · The highlands comprise the Himalayas and adjacent mountain ranges to the North, Rising to 8611 meters at the top of K-2, the world second highest peak; the Central Sulaiman Range and its southern extensions (RAS KOH, SIAHAN, and KIRTHAR Ranges); and the Western Baluchistan Plateau. · The lowlands comprise the Indus river plain and a narrow stretch of coastline bordering the Arabian-sea. · The whole Northern Area of Pakistan is dominated by mountain Ranges and foothills of the Western Himalayas that are the catchment areas for the Indus River. · Snow-clad granite mountain in the far North Reach up to 7700 meters. · On the Western side dry, cold plateau and mountains of Baluchistan, Commonly termed as Baluchistan Plateau are present. · The Indus River and its main eastern tributaries, the Jhelum, Chenab, Ravi, and Sutlej arise from Snowfed Mountains and flow through Punjab and Sindh plains called INDUS BASIN PLAINS and into a wide delta before entering the Arabian Sea. · On the Eastern side of Indus Basin Plains are the sand dunes and desert of Cholistan and Thar. · Pakistan has extreme of climate, from Arid to Hot desert in the South-West and to frozen. · The Southern and Eastern parts of the country are under monsoon influences, with Rainfall mostly occurring in the hottest month of June and July. · Precipitation in the drier Western and Northern areas comes as Rain during winter, and in the North as Snow. · The Himalayan foothills of K.P.K, AJK and Northern Punjab receive much rain about 500 to 1500 mm during summer. · The Punjab, Sindh and Baluchistan plains and desert get less than 250 mm of rain and summer temperature average well over 400 c in these areas. · The drier part of the country is South-Western Baluchistan. · The Rainfall is unpredictable in these areas and mean Annual Rainfall is about 50 mm. · The mean Winter Temperature of this area is as low as 40 c and mean summer temperature is 400 c.
Climate, Soil, and Topography are sufficiently uniform to permit the development of a similar type of vegetation. 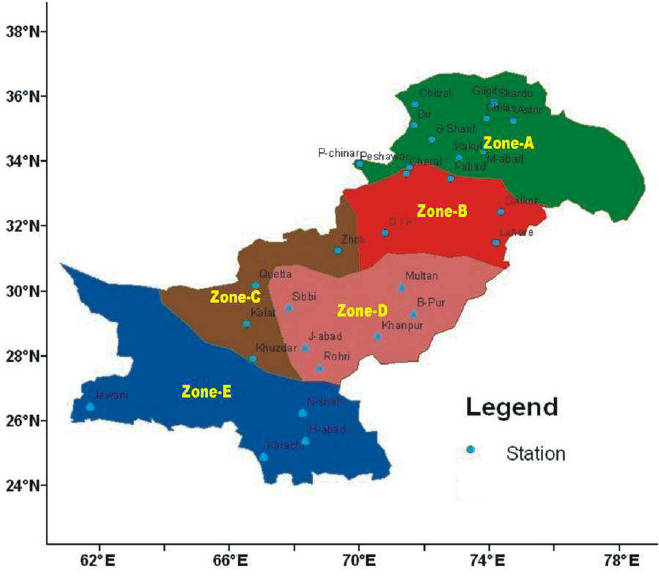 · Due to geographical position and physiographic Pakistan has a great diversity in its climate. · These major factor ultimately affect and modify rainfall and temperature which are essential elements of any climate. § This Climatic Region is characterized by a steady sea breeze through out summer. § No major change in annual and diurnal temperature. § M.A.T. = 320 c.
§ The climate of these regions are mainly hot. § These lands are characterized by great annual and diurnal temperature variations. § The rainfalls is mainly during the hot period. § The climatic conditions are some how same as that of Arid Sub-Tropical Continental low lands but. § M.A.T. = 4 – 400 c.
§ At least two humid months. § Winter and summer distinction colder than Semi-Arid and Arid Low Lands. § Winter season is cold, snowy and foggy. § Late-winter and summer rains are common. § Climatic elements variant in the region over short distances due to variable altitude and direction of exposures. § Snowfall usually starts from late December or early January and end in February. i. Himalayan mountains including intervening narrow valleys. § This is characterised by extreme aridity. § Rain mainly in cold season i.e. (January – February). § Sand blows almost through out the year. § Sever dust storms in mid May to September.